The type of ceiling finish you choose has a dramatic impact on the overall atmosphere of a room. Ceilings reflect light, so any imperfections in the drywall or seams are likely to show through after time. However, while texture can conceal imperfections, it isn't for everyone and might be unappealing to future homebuyers, according to "Staged to Sell (or Keep)," by editor and decorator Jean Nayar. Smooth ceilings are attractive when seams are well disguised. Smooth ceilings have a polished and clean appearance when they're finished properly and don't have any visible seams. However, keep in mind that new homes with seamless ceilings may develop unwanted seams as the home foundation settles over time. Textured ceilings come in a variety of styles, including popcorn, knockdown and orange peel textures. Popcorn texture is often used to provide noise insulation, since it acts as a sound barrier. If you decide to texture your ceiling, you can use either powdered or spray varieties. In his book "Build Your Dream Home for Less," author and professional handyman R. Dodge Woodson recommends texture sprays, which are very inexpensive. Texture can also be applied manually. To create a stomped ceiling, simply apply drywall compound and use a broom or potato masher to create texture. Although it's a bit more challenging, you can create a swirled effect by using a sponge to create swirl patterns in drywall compound. Some manual textures, such as orange peel, are difficult to execute, so you might consider hiring a subcontractor to finish the ceiling. Smooth ceilings are finished the same way as normal drywall. 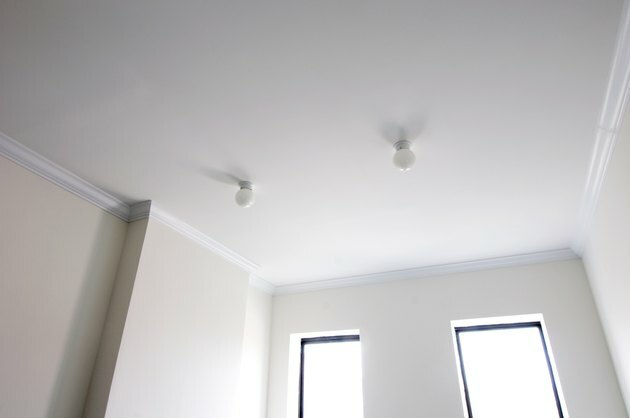 Be particularly sure to use primer on your ceiling, since it will dramatically increase the quality of the paint job. Once you finish priming the ceiling, paint it in a color that enhances the room's overall appearance. Use warm, rich colors for spacious rooms with very high ceilings, and lighter shades that are almost the same as the other wall colors to create the illusion of space in small rooms. As noted in "Staged to Sell (Or Keep)," many people consider popcorn textured ceilings to be unattractive or simply outdated, with hand-textured or smooth ceilings being the preferred options. If your property has a textured ceiling and you find it unattractive, it's possible to redo it in a different texture. However, you'll probably need to hire a contractor to complete the project. Not only is removal difficult, but the ceiling may also contain asbestos, which also makes the process potentially dangerous. How Much Joint Compound Per Square Foot for Textured Ceilings?